Ballymena United manager David Jeffrey looked like he had gone 12 rounds with new WBA World champion Carl Frampton after Saturday’s 6-0 defeat to Crusaders on Saturday. 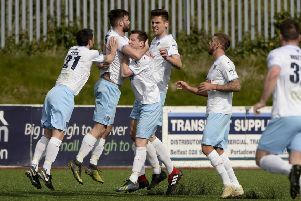 It was a crushing opening day league defeat for the Sky Blues and it was three goals in three minutes in the first half that knocked the stuffing out of the United challenge. Jeffrey’s side - until the first Crues goal in the 17th minute - had looked compact and solid. But former Linfield manager Jeffrey says that three goal salvo had his team on the ropes. “For the first 15 minutes I thought we were very comfortable and I thought we were playing good stuff, And in fact I thought we could have been the better side at that stage. “And then three goals in as many minutes and there were like three Carl Frampton KO punches. “To be honest with you, the defending was poor and they didn’t have to work as hard as they should have to score the three goals. And Jeffrey thought his side should have got on the scoresheet in the second half. “We created three to four good chances in the second half but we failed to score. And Jeffrey admitted it will take time for all the new signings to gel at the club.